Flickli - the patch! Set retro apple green on pink, iron on patch, appliques, Flicklis - specially reinforced fabric patches, perfect as a knee or elbow patches suitable! 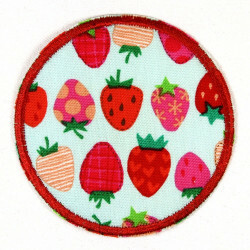 This iron on patch with apple motif, colorful in green and pink bring you this fruity fruit on the clothes! The apple Ironing patches in the perfect retro shape are ideal because of their high tensile strength and reinforcement as knee patches and patch pants. Even as Apple Iron-on jackets or shirts see this Patch with the apples gorgeous. These Apple appliques, like all Wertstueck Flickli supplied patches to iron, in a beautiful package with a detailed and easy to follow bow instructions.